We have developed this station over a number of years and are now settled on the current configuration. Most importantly, on receive we suffer negligible overload problems with strong 2m stations. Sure, if we sit 3kHz away from G3RFR/P who is our nearest neighbour, then we get splattered to death, but move a little further and everything goes quiet. You might ask why we are using a huge 1.5KW amplifier when the UK legal limit is only 400W! Are we cheating and heating up the Ether? Quite simply, the amplifier loafing along at 400W output means that it runs dead cold and our signal is as clean as humanly possible. Also the transverter is hardly working at all to drive the amplifier, so that runs clean and cool too. The Beko amp has a very accurate peak-reading power meter on the front panel, but we always have the Mirage MP-2 in-line. This is for no other reason than it used to belong to a dear contesting friend Vic, G4PJO, who is now silent-key and we like to think that RF passing through the meter is somehow blessed on its way in and out! The DB6NT transverter uses a 14MHz IF. 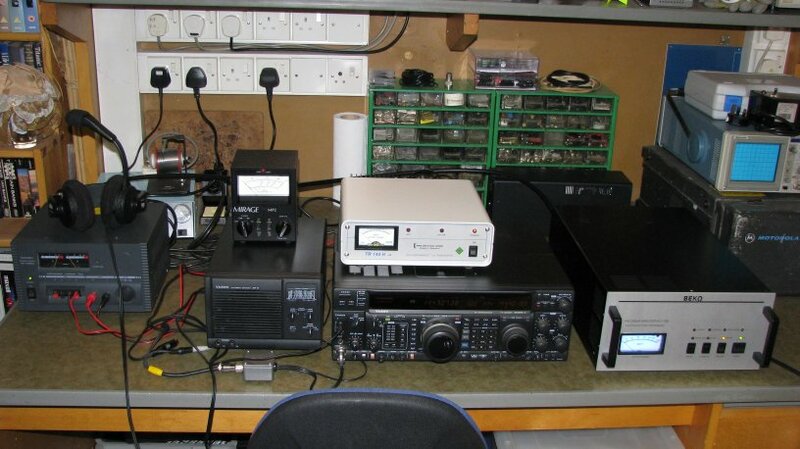 Most HF rigs perform better at 14MHz than 28MHz, plus it gives us the option of using other transverters for 6m and 70cm simultaneously, driven by another HF rig on 28MHz. The transverter includes nice slow sequential switching for both the Beko power amp and SSB Electronics masthead preamp just to make sure nothing goes bang. On the audio side of things, the Heil ProSet has the HC4 DX element installed and we use a Heil footswitch to key the rig. A Yaesu DVS-2 digital voice recorder is used for CQs and really saves the old vocal cords.........to those who disapprove and think it is lazy..........just try it for 24 hours! We have modified the SP-8 speaker so that when the Heil headphones are plugged in, the speaker audio is NOT cut off - means that the operator can concentrate, but everyone else can still hear what is going on. 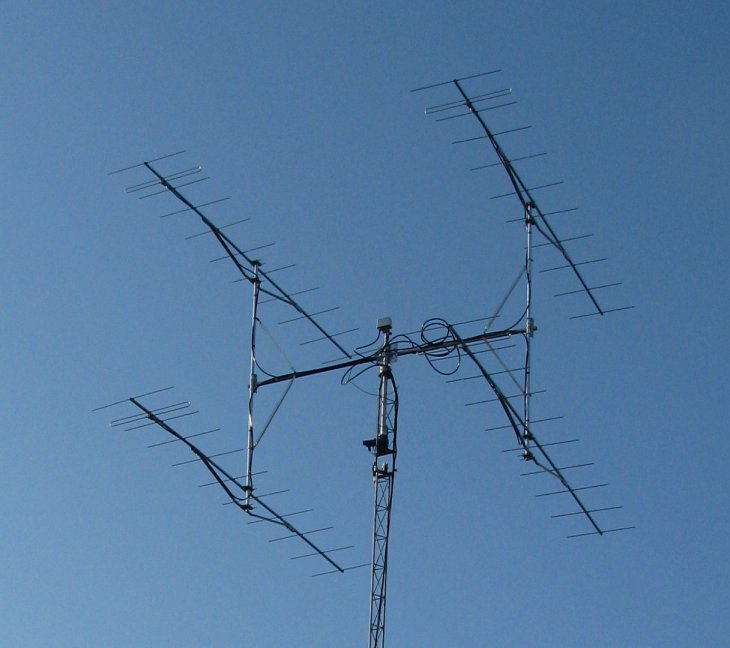 We rate the Pro Tonna antennas very highly. Yes they are expensive, but the build quality is superb. Our box of 4 x 11 elements has a sharp beamwidth - you just need to remember to use the rotator from time to time. On that subject, the Pro Sis Tel rotator has a very advanced control box with a preset facility that lets you dial-up a particular heading and then it turns without further operator input, together with a soft start/stop. Under manual control, the operator is locked-out for a few seconds after making a move so it is impossible to start wanging quite a few Kg of antennas left and right without any thought to the laws of inertia! All the coaxial cable is Ecoflex15 from SSB Electronics. This cable has extremely low loss and is far more flexible than good old fashioned Heliax. SSB Electronics made the cables to be exact multiples of electrical half wavelengths for us and even tested each one @ 144MHz. Bit over the top maybe.....not really, as we also use the station for Moonbounce (EME) on some science courses that we run for schools. For our logging, we have always used the excellent SDV software from Paul O'Kane EI5DI. The software is installed on a rack-mounted PC under the operating bench and a rack-mounted keyboard drawer saves clutter. The rack also contains a large UPS to keep the computer going should the generator fail.